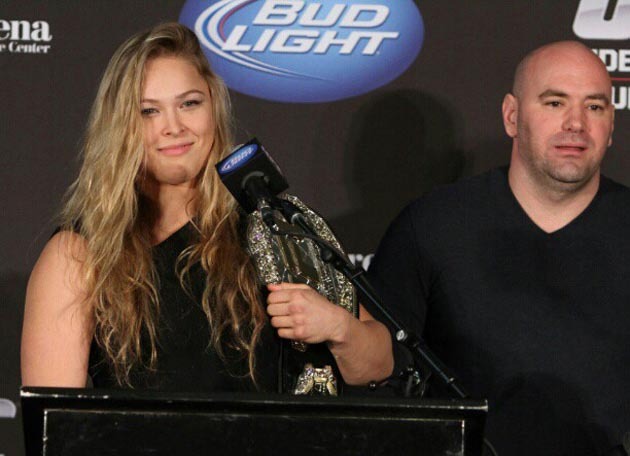 It's official: Ronda Rousey is the UFC's first female champion. The one-time Strikeforce bantamweight champion is the first female champ in the UFC, and received her belt on Thursday to prove it. Rousey also has her first opponent. Rousey will fight Liz Carmouche at UFC 157 in Anaheim. "It means a lot," said Rousey at the UFC on Fox 5 press conference. "I feel like we have a lot to prove at this event and no one's going to be disappointed. The women are here to stay and we're gonna prove it." The UFC will break two barriers with this fight. Not only will it be the first time two women fight for the UFC, but it's also the first time an openly gay fighter will take to the Octagon. Carmouche is a lesbian who served under Marines "Don't Ask, Don't Tell" policy, which is no longer in place. She has been out for much of her MMA career. It's a career with a record of 7-2. Her losses are to former Strikeforce bantamweight champions Marloes Coenen and Sarah Kaufman. Rousey is undefeated, with all six wins coming in the first round.